Actress Natalie Dormer said she would not want her latest film to have its European premiere anywhere other than Edinburgh. 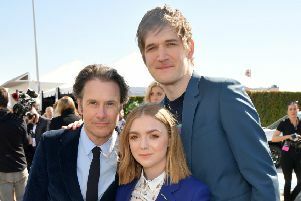 The Game Of Thrones and Hunger Games star was on the red carpet on Tuesday for the Edinburgh International Film Festival (EIFF), for the showing of In Darkness. It is the 36-year-old’s writing debut, having worked alongside partner Anthony Byrne for the project. Dormer, who also stars in the film, said: “I’m absolutely delighted to be having the European premiere of In Darkness in Edinburgh - there’s nowhere I’d rather have it, to be honest. The psychological thriller tells the story of blind pianist Sofia who overhears a struggle which leads to the death of her neighbour. She is then drawn into the criminal underworld, which has links to her own past. Dormer has spent the last seven years developing the main character and plot, before finally getting it onto the silver screen. She said “(Writing) has been a steep learning curve, but very enjoyable - I’d love to try again sometime. “It was easier to play a character that you’ve written because you know their psychology inside out. Dormer was at the EIFF in 2013 as a juror for the international feature film prize. Byrne, director and co-writer, said: “It’s really special for both of us to be here because the festival, well, it’s so well-established.